Got hooked on this cherry coffee when visiting my daughter in MI. I stock up every time I go to MI. Last time my daughter came to CO for a visit, I had her bring me a 5 lb bag of beans. Almost gone! Hard to find elsewhere and why bother looking. This is just THE BEST!!! 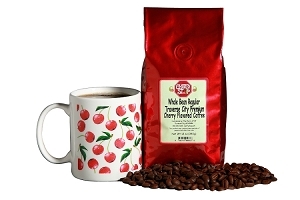 The smell of brewing cherry coffee invites everyone to the coffee pot. We look for excuses to head north to Traverse City and the best two are that we used our last bag of cherry coffee or cherry BBQ for the Cherry Stop! We are addicted to the Cherry Coffee!! We just can't find anything close to the flavor we get from it. Every morning we wake up, brew the coffee and enjoy the wonderful aroma that fills our kitchen. Its the best! !